For a versatile, all-weather tent, you can't do much better than the Mountain Hardwear Hammerhead 3. Its waterproofing keeps you dry in the rain, the sealed walls keep you warm in the cold, and the numerous mesh panels keep you cool in the heat. Mountain Hardwear is a company that makes good tents at fantastic prices. If you're on the lookout for a new three-person tent, you'd do well to take a closer look at this Mountain Hardwear Hammerhead tent. We here at Camping Tent Reviews are a little bit on the fence about the Mountain Hardwear people. The products they make are mostly decent, some are downright great, and others hardly bear mentioning. That being said, this tent is probably one of our absolute favorites from the line. Not everyone, however, is head-over-heels for this specific model. The reasons for this vary, but most people cite the shelter's weight as it biggest problem. 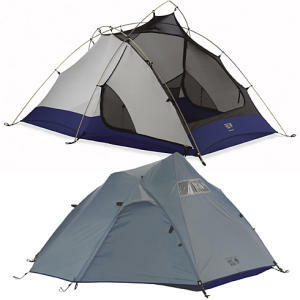 Other consumers have had issues with the integrity of the tent's poles. But even the people who have had negative things to say about the Mountain Hardwear Hammerhead 3 tent, tend to agree that it is a shelter well worth the price. And some naysayers even say that it is still a fantastic deal. Do you feel the same way? Below, we at Camping Tent Reviews will go a little further in depth about this great shelter in an effort to help you answer this very question. Floor Size: 7' 7" x 5' 4.5"
Vestibule Area: 19 ½ sq ft.
Like most other MH products, this model is incredibly simple to set up. According to one Mountain Hardwear Hammerhead 3 review, a single camper can assemble the tent in less than five minutes. It's truly unavoidable: camping tents are going to collect condensation. It's just a fact of nature. But with the Hammerhead 3, consumers have been saying that the condensation has been absolutely minimal. With 46 square feet of interior space, this is one of the roomiest three-person tents on the market. The walls aren't as steep as some other shelters (like those in the line of Marmot tents), but for three people, it's still spectacularly spacious. On Backcountry's website, the Mountain Hardwear Hammerhead 3 sells for a mere $300. For the quality of design and high performance it offers, this is a great deal for a great tent. The packed weight of this model is eight pounds. This is pretty heavy for a three-person tent. Sure, the weight can be split among campers in your party, but it's still more cumbersome than other models from other brands (i.e. 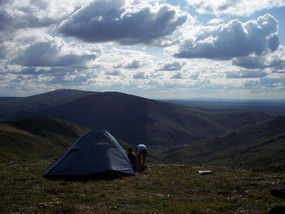 products like the Marmot Limelight 3 or the Black Diamond Skylight tent). There have been reports among the online consumer review community that the Atlas 7001 aluminum poles that come with the tent aren't the best out there. Some people have experienced snapped or bent poles with constant use. As long as you are taking care of your equipment, this shouldn't be a problem for you. While some people don't like the fact that packed up, the Mountain Hardwear Hammerhead 3 weighs in at eight pounds, and others aren't trusting of the factory poles, this is still a fantastic three person, three season tent. The price is right ($300) , and the shelter works. In rain, in cold, or in weather too warm to bear, the Hammerhead 3 can be modified to keep you comfortable. And with such a large interior area (46 square feet), you'll find it suits three campers well. If you do decide to pick up this tent, don't forget to purchase the Mountain Hardwear Hammerhead 3 footprint. This will create a moisture barrier between the ground and your tent, adding years to its life. Bottom line: if you want a truly great 3-person tent that won't cost you an arm and a leg, consider picking up the Mountain Hardwear Hammerhead 3 tent. It will not let you down.